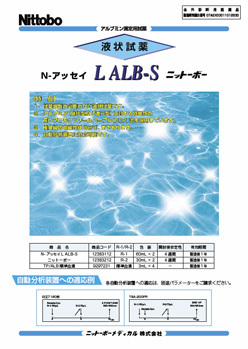 NITTOBO MEDICAL CO.,LTD. - Supporting medical treatment at your clinical inspection site. Since we have experienced first-hand the rapid changes at medical sites, we feel motivated to push the bounds of bioscience by developing clinical inspection reagents to meet the needs at the site. 2010.1.21 Updated Medical society information on the 1st Civic Forum “Stop the Osteoporosis” by Hokuriku University was updated. 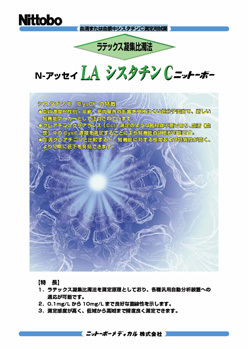 2009.11.17 Updated Medical society information on Clinical Proteomics in Chiba was updated. 2009.9.28 Updated Medical society information on the 1st National Meeting of Team Medical Care Promotion was uploaded. 2009.9.7 We will have an exhibition booth at the 41st meeting of Japan Society for Clinical Laboratory Automation. 2009.8.11 Renewal of Package Design! Mousse Hand S: detergent for disinfect and sterilization for hands and fingers. 2009.7.17 The link with the General Incorporated Associations of the Team Medicine Members' Forum began. 2009.7.1 Nittobo Medical's website has just been renewed! List of News is here. 2010.1.21NEW!! Updated Medical society information on the 1st Civic Forum “Stop the Osteoporosis” by Hokuriku University was updated. 2009.7.1 We will have an exhibition booth at the 58th meeting of Japanese Medicine Inspection Society. List of Medical Society Information is here.